The icon 8 from left, contains the function "Copie"
Would it be possible to post an image to understand better ? On www.composant-dynamique.com create the kitchen of your dreams. Hi, your question may be a bit confusing, at least to me. 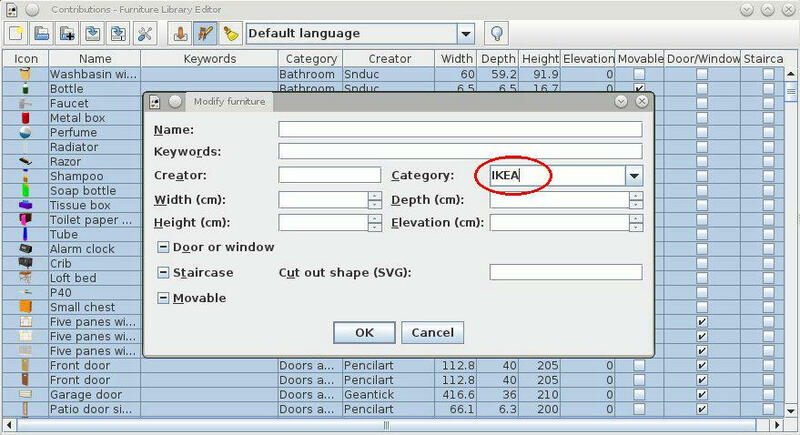 Toolbar Icon 8 from left in Furniture Library Editor is Modify selected furniture (in SH3D, nr 8 is Copy - and as far as I can tell it works according to convention?). But obviously I am missing something. Maybe you could elaborate? After this save your furniture library under what name you want. I made a bad manipulation and I do not know how to cancel ? To add a column of information with the "PRICE" of the imported 3D objects, would revolutionize the use of 3D Sweet home. 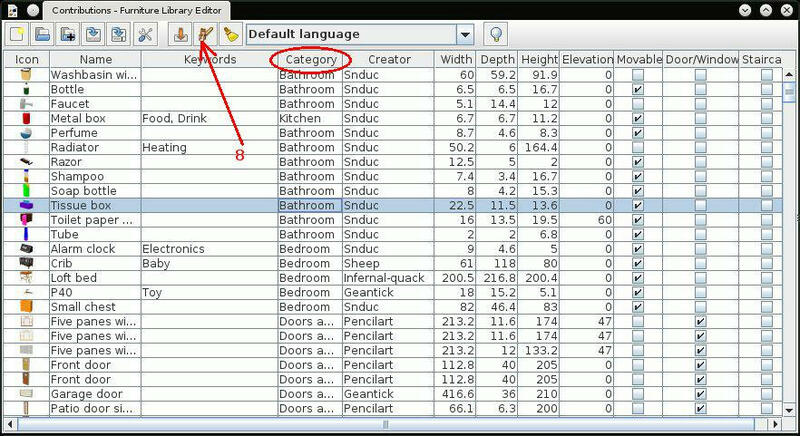 By exploiting the file CSV, it would be possible to make the evaluation of the prices at the same moment as the plans of our house. I would agree that more of the properties could be made available to the user (tntdavid: look at the DefaultFurnitureCatalog.PropertyKey) price being one (+ creator and more). This provides extra information in the Furniture Catalogue view and - as the example shows - even lets you link to where you can find the item. Maybe I am missing something, but I have not found a way of making these properties visible in the Home Furniture List. And that I think could be very useful. Especially as this list is so easy to copy and paste into a spreadsheet, it would be very easy to calculate total cost of all items. As for the Furniture Library Editor, I don't think there is an Undo feature on the drawing board (see this post). I admit this has caused me some heartache too, but if you always work on copies and backup for every change, it is something I can live without. But - repeating myself - I would like as many properties as possible available when using the Editor. Simply because the detour of unzipping/opening the PluginFurnitureCatalog.properties and then reloading the catalogue, is distracting the process of creating objects. Now, all these issues are, I believe in the wish-list / feature requests, and I feel a bit guilty for discussing them again. After all, whenever eTeks releases new versions, one can tell that careful consideration has gone into the priorities. But yes, these features would be very welcome also for me. And the good news is, that SH3D is clearly designed for such future capabilities. The priority absolute for me is to make visible the price of the 3D objects. Sweet home will be from then on, the best free 3D software for cuisinistes and many other Building trade. If this function does not go out to the next version, the biggest sccès will then be put back. Prices management is already more or less programmed in Sweet Home 3D and the Furniture Library Editor, but I don't feel like activating this feature in the default release. The information property is stored in .sh3d files from version 4.2, but wasn't viewed in the furniture list until Sweet Home 3D 4.5 that now displays a clickable icon at the right of the name column for the pieces which have such information available. Thank you! Clever solution with the non-changeable, linkable reference. This is bound to be a great improvement for interior designers and anyone who wants to provide model libraries for SH3D. Design a room, provide the file and link each item. Also, it will let a creator maintain some control over models in terms of copyright etc. Very good. Basic HTML seems to work beautifully (font colours, links). However, I suspect one should keep it simple. For instance, by using HTML entities (basic character set): € did not work, but &euro; does. Which means you get a link to your model (and could even quote the price in the link). Even if this does not answer to a wish for having price as an optional Furniture column (so you can put it in a spreadsheet and get totals), but that is a different question. And this is, methinks, more important. PS - I still have the SF Bugs 499 problem that my editor seems to corrupt the item I work on in PluginFurnitureCatalog.properties, so the item does not import correctly to SH3D. However, if I open same file with Furniture Library Editor and save, the file appears fixed. I have not figured out what this might be, but Furniture Library Editor appears to have a greater tolerance of sh3f files than SH3D - go figure.